Remember when you were a kid, and your mom sent you outside with a Fla-Vor-Ice Pop? To cool down in the hot summer, we'd eat our pops and then run through the sprinkler. The best thing about Fla-Vor-Ice is they are "mom approved". Did you know they are gluten free, low in calories, and sugar? Each standard pop has just 5 grams of sugar. Like Fla-Vor-Ice on Facebook for more information and tons of fun ideas. Kids like Fla-Vor-Ice Pops, because they are a fun and refreshing treat with great tasting flavors. They come in original fruit flavors, Tropical flavors, and even a sugar-free variety. There is a Fla-Vor-Ice Pop for everyone. During summer camp, we always have a box of freezer pops in the ice chest. Since ice-pops are portable fun for everyone, you never know when one might come in handy for one of these fun things to do with Fla-Vor-Ice Pops. 1. 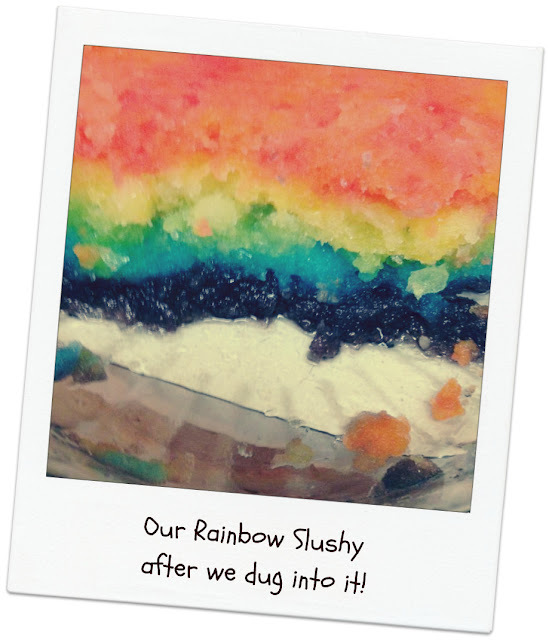 Make a homemade, rainbow slushy for your next summer party. Summer Party Recipe Ice Pop Rainbow Slushy. 2. Keep frozen Fla-Vor-Ice pops in an ice chest during outdoor play dates or summer vacations, and use them as a quickie first-aid ice-pack for head bumps and boo-boos. They also help with hydration. 3. For a fun, outdoor game use ice-pops and party cups. Line the children up, so each one stands two feet in front of a party cup, cut-off the end of their ice-pop, and count to three. On three, everyone tries to squeeze their frozen ice into the cup without missing. The winner is the one who flings the most frozen Fla-Vor-Ice into their cup. 4. Squeeze your frozen Fla-Vor-Ice into plastic Easter Eggs and then refreeze them to make a fun Easter Egg shape ice-pop treat like these from Play Eat Grow blog. Picture from Play Eat Grow blog. Hop over for more great ideas. 5. Use Fla-Vor-Ice freezer pops in a homeschool science lesson about the changing states of matter. Time the ice-pop to see how fast it freezes. Compare it's freezing time with that of other liquids like milk, water, or yogurt. Let it melt in a bowl on the counter, leave it out, and then track how many days it takes to evaporate. Does it completely evaporate? 6. Before your freeze your pops, pour the liquid into fun ice cube molds, and use them to flavor your favorite clear soda. Yum! It's your turn, what will you do with your Fla-Vor-Ice pop? Hop over and share your ideas on Fla-Vor-Ice on Facebook!